“Hi Wisconsin! Last night I drove in from Boston to be here with you, because I am from Milwaukee and I am one of you. I work for a labor union in Massachusetts and I love our members, but when I heard that our state was hurting I had to come. And I came for three reasons: love, anger, and hope. “I came out of love for my high school teachers at Nicolet High School – Ms. Keane and Ms. Byrne – who taught me how to think freely and critically. I came out of love for the nurses, residents, and health care workers at Wisconsin’s Children’s Hospital who took care of me when I underwent heart surgery five years ago. I came out of love for my mom, who works 60 hours a week at a dry cleaners for minimum wage and no benefits, who supports my dad who is unemployed and my youngest sister who is on Social Security because of lifelong learning disabilities. “And I came out of anger at this proposal [to end collective bargaining rights], which will hurt all the people I love. This proposal will cause my high school teachers to lose their right to negotiate over the conditions of their work. It will make them work longer hours with more students for less pay and deteriorate one of the best public school systems in the country. The proposal will force the nurses and residents who took care of me to accept more patients per shift when they are already overworked. Even Badger Care – the already meager, poor, pathetic public assistance medical insurance program that allows my mom to see a doctor once a year to deal with her backbreaking arthritis is at risk. The Fellowship taught Ben to connect his story to the stories of others so that they, together, can make change. 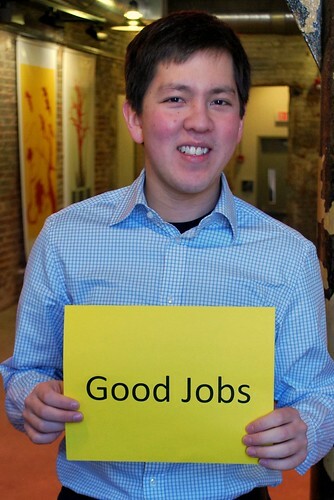 Ben Kuss is fighting for good jobs. What will you fight for?